According to Investopedia: Investment horizon is the term used to describe the total length of time that an investor expects to hold a security or a portfolio.The following set of charts are a great visual aid to help investors plan and set expectations for investing in the stock market. DFA Domestic Balanced Strategy Index: This is a diversified blend of Dimensional US equity indices. The index is weighted roughly two-thirds large cap and one-third small cap, along with a tilt towards value. Indices are hypothetical and cannot be invested in directly. 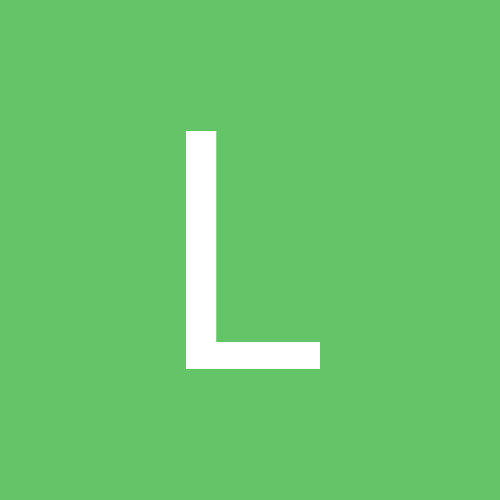 One-Month US Treasury Bills: This is a commonly used proxy for the risk-free rate of return on cash. Stocks are highly volatile in the short term, for example a holding period of one year. 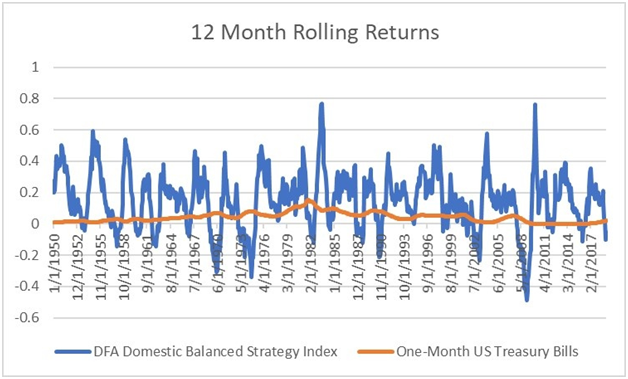 The following chart plots all rolling 12 month returns since 1950. 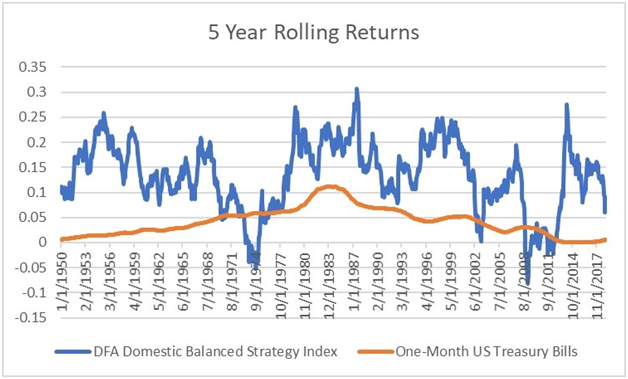 This chart tells almost everything we need to know about investing in stocks for a 12-month period. If that’s your planned holding period, don’t do it! Not only will the investment frequently underperform cash, it will lose money. Sometimes a boatload of money with 12 month returns ranging from approximately -50% to +80%! On a year by year basis, extremes are normal. If the investment will need to be liquidated for a lump sum of capital within the next 5 years (i.e. a home down payment, car purchase, tuition payment or a readily available emergency fund), it’s probably best to not place the capital in the market as we can see in the next chart. This chart is less noisy, but there are still periods when stocks have lost money over a 5-year period and even more when stocks underperform cash. For this time horizon, it’s reasonable to keep the lump sum capital in cash. Investors with the willingness to accept risk could consider keeping a modest portion in stocks with the awareness the money could be lost. At 10 years, the advantages of investing in stocks is seen more clearly.However, history shows there is still no guarantee. For example, as recently as the bottom of the 2008-2009 crisis, the DFA index just barely produced a positive return over the prior 10 years and would have underperformed cash. Note that an S&P 500 only investor would have done far worse, losing about 30% of their capital during this period highlighting the benefits of the size and value diversification in our DFA index. Experience teaches that many investors tend to think 3 years is a long time, 5 years is a really long time, and 10 years is an eternity. 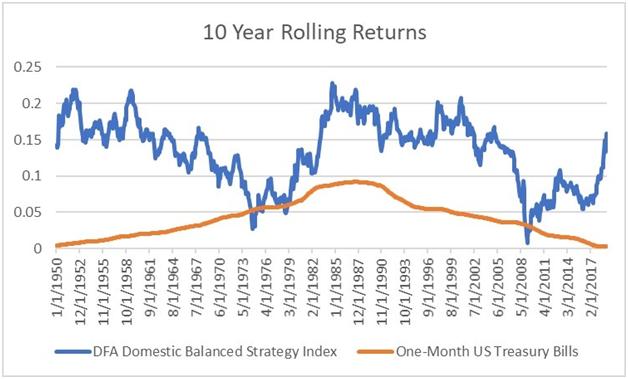 Yet history shows us that at even the 10-year time horizon, expected return relationships (such as stocks to outperform cash) don’t always materialize. This must be true, otherwise there would be no risk.Investors with a 10-year time horizon before needing to liquidate funds (a frequent example of this is a child’s 529 college fund), should invest a portion of the capital in bonds and cash with plans to increase the amount invested each year. Of course, all of this depends on each individual’s willingness and need to take risk, which is why financial planning is a personalized case-by-case process. It gives advisers the opportunities to help investors achieve their goals wisely and with the least amount of fear and stress in the process. 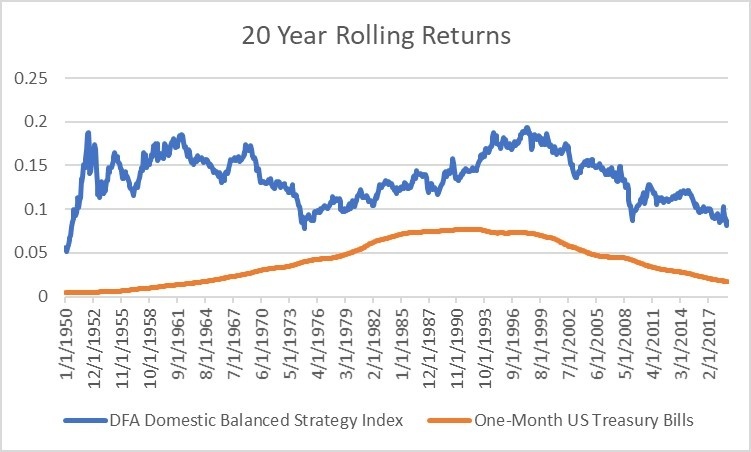 The next chart shows the 20 year rolling returns. 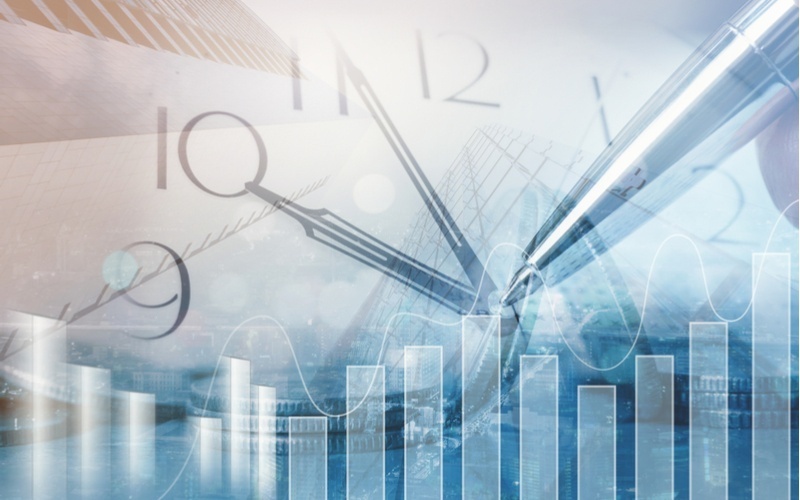 Many investors in their 50’s and 60’s don’t think this time horizon applies to them because they envision retiring at age 65. What many forget is that the time horizon for retirement planning is different than oneforpaying for a child’s college education. When a child goes to college, the expected depletion of the account is typically within 4 years. A couple entering retirement usually needs to make the capital last for up to 30 years by taking a series of smaller annualized withdrawals.A child entering the first year of college should typically have very little in stocks while a couple entering their first year in retirement will typically want to have the majority in stocks. We see that there are no 20-year periods where stocks underperform cash for the DFA index since 1950. If a retirement investor follows the conventional approach of a 4% safe withdrawal rate, 96% of the portfolio remains invested each year for growth. Annualized stock market returns are much more stable historically once to and beyond this timeframe with the gap between the best and worst periods ranging from approximately +5% to +19%. 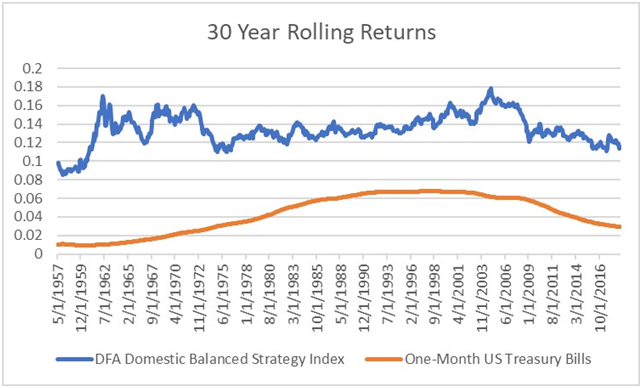 Last, study a 30-year periods;the contrast between this chart and the 12-month chart is significant. At the one-year time horizon, it’s hard to justify investing in stocks. At the 30-year time horizon, it’s hard to justify not investing in stocks. Risk for short term capital is volatility of principal, while risk for long term capital is erosion of purchasing power due to inflation. Good financial planning considers the time horizon for each objective and invests the need capital accordingly. 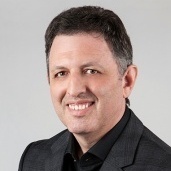 Jesse Blom is a licensed investment advisor and Vice President of Lorintine Capital, LP. He provides investment advice to clients all over the United States and around the world. Jesse has been in financial services since 2008 and is a CERTIFIED FINANCIAL PLANNER™ professional. Working with a CFP® professional represents the highest standard of financial planning advice. Jesse has a Bachelor of Science in Finance from Oral Roberts University. Jesse manages the Steady Momentum service, and regularly incorporates options into client portfolios. Options traders are “data wonks,” meaning we all rely on information to make what we hope are informed decisions. But how do you know the difference between valuable and reliable data on the one hand, and rumor or speculation on the other?